Last week, Hudson Yards premiered one of the most exciting mixed-use development projects NYC has seen in years. The $25 billion dollar development opened on March 15, 2019 to the public and within minutes, the 7 story mall was crawling with New Yorker’s eager to try the fare at new restaurants and shop till they drop at the new retail stores. Other than the awesome eats and amazing new places to pick up some new duds, a certain 150 foot tall honey-combed art installation crafted by none other than British artist Thomas Heatherwick, has attracted a number of tourists and locals alike. But, before Hudson Yards became NYC’s new place to be this spring, it was a transformative and ever-evolving space whose history is ingrained in the culture of New York City. The presence of train lines appeared in 1849, with the development of the Hudson River Railroad. For quite some time, the Hudson River Railroad which was purchased by Cornelius Vanderbilt, would control access into Manhattan for almost half a century. There were specific changes that took place at the turn of 20th century, when the competitor railroad, The Pennsylvania Railroad, developed their own system. As the years went on, Hudson Yards remained a mostly isolated railyard. Other than the development of the Jacob Javits Center and the John D. Caemmerer West Side Storage Yard which opened in 1986, the area had been left relatively undeveloped. This changed drastically beginning in the early 2000’s when New York sited the isolated territory as a potential place to hold the 2012 Olympics. This development plan involved four significant parts. This included the extension of the 7 train, large-scale rezoning, expansion of the Jacob Javits Center and the implementation of a new sports venue. By 2004, the first three sectors of development passed approval with an exception of the sports stadium. This then transformed into plans to create the large scale megaproject which is now Hudson Yards. Hudson Yards has officially taken on a life of its own. The grand opening last week showcased a thriving and exciting space for commerce and place of assembly for tourists and locals alike. The development features two spaces dedicated to community gatherings; the Vessel and the Shed, a mall with a number of places to shop, restaurants and a number of community residences that are still in development. 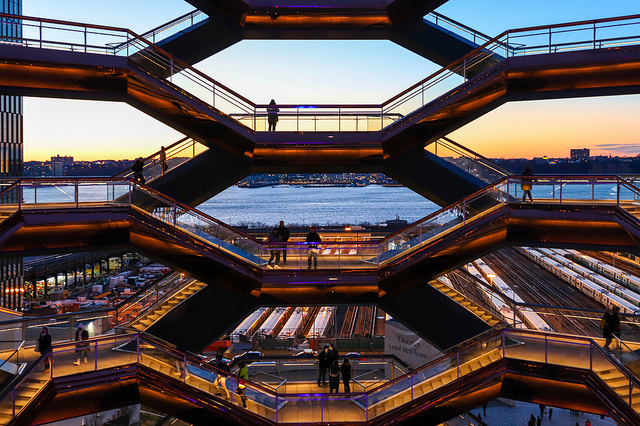 The Vessel and The Shed are creative architecture pieces that provide opportunities for people to literally and figuratively see New York from different viewpoints. The new centers promote art and culture and will be for sure, one of the go-to places on many visitors must see NYC list. The new retail shops include brands such Neiman Marcus, Artizia, B8TA and H&M (A KPA designed store). The restaurant and market space is loaded with diverse fare choices and brilliant ambience for visitors to enjoy. The creation of spaces such as Hudson Yards, are deemed revolutionary not only because of their enormous size or the attention it will garner, but moreso of its reflection of the transformative nature of New York City. The aspects of art, design, commerce, and entertainment define a metropolis like Manhattan and reflect the current state of the culture and the people who inhabit the land. Hudson Yards is a landmark in the making whose evolution is now a part of history.